Lately, my team and I have to spend a lot of time to go after people who are offering stamped images of Whiff of Joy's stamps as downloadable image on the web. This is illegal, costs a lot of nerves, money and violates the copyright of our artists and stamp illustrators. I am very grateful that the stamping and crafting community is so strong - I received lots of emails from people who kept their eyes open and found illegal sites on the web. Thank you so much and from the bottom of my heart. Without you, we would have no chance to fight this! Mo Manning from Mos digital pencil, a wonderful digital stamp illustrator, created the below site for us to team up and support each others in our fight agains copyright and licensing violations. Please grab the below banner if you woul like to support us and help spreading the word. Maybe this helps to put a stop to the illegal offering of our hard work. In letzter Zeit müssen mein Team und ich viel Zeit damit verbringen illegalen Angeboten von gestempelten Whiff of Joy Motiven im Internet nachzugehen. Immer mehr Leute bieten unsere Motive als Download an, was ein Verstoß gegen das Copyright unserer Illustratoren ist. Dieser Verstoß kostet viele Nerven und Geld. Ich bin sehr dankbar für den Zusammenhalt in der Stempl- und BastelCommunity. Ich erhalte regelmäßig eine große Zahl von Emails in denen ihr mich auf diese unehrlichen Leute aufmerksam macht. Ich danke euch dafür!! Mo Manning, von Mo's digital Pencil, hat die Initiative ergriffen und einige Stempelfirmen vereint, um gegen dieses immer größr werdende Problem zu kämpfen. Bitte unterstützt unsere Bemühungen und verbreitet das obige Logo, um auf diesen Misstand aufmerksam zu machen. Good for You Katharina... I think the crafting blog community will be strong, and stand together through this. Hang in there! 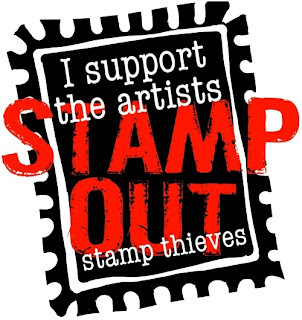 Never saw it before, but I am glad you can catch them because it is so unfair to the ones who are glad to spent money to be getting those lovely rubber stamps (mmmm drool) so your artists can keep creating! (that's also why I buy every one of my cd's instead of downloading them) so I hope they stop doing it! P.S. I saw a card with a Whiff of Joy stamp in a magazine I bought yesterday lol keep up the good work!